The magnolia courtyard. All photos courtesy of Bardessono. Some hotels wear their sustainability cred like a badge of honor — proudly bragging about one or two achievements, usually alongside a slew of other not-so-eco-friendly activities. Bardessono carries theirs humbly from head to toe. The LEED Platinum Certified hotel, one of a few in the U.S. with this designation, was built from the ground up with a minimal footprint in mind. Literally, with salvaged local wood and repurposed stone quarried in Napa Valley 80 years earlier when the original Bardessono family homestead and vineyard were built. The property generates a significant portion of its energy from solar paneled roofs; minimizes its heating and cooling needs by using tons of glass, wide overhangs, and motor-powered and energy-efficient Venetian blinds; ensures indoor air quality by using only organic, non-allergenic materials; and plants an herb in their organic culinary garden every time a guest opts out of housekeeping. (Okay, we love that.) The hotel would probably be the first to admit that such measures are just a start, though most guests are too blissed out to even notice. 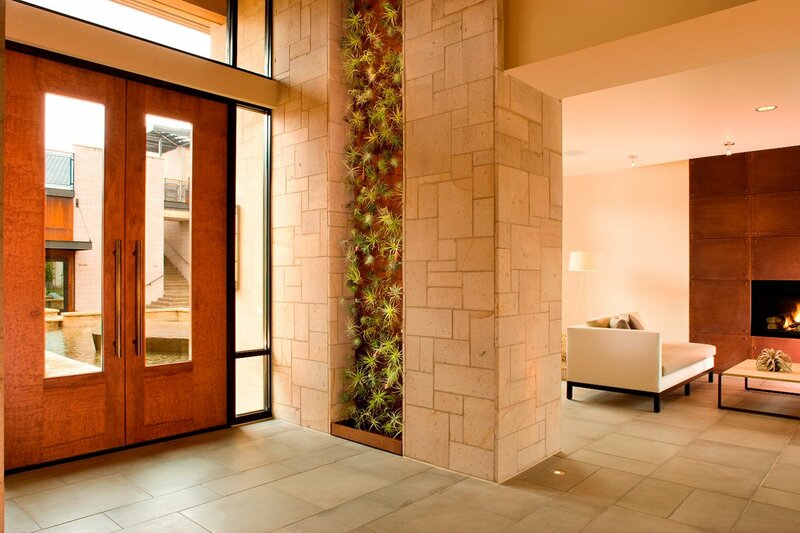 They’re here to engage in sustainability practices of a personal sort: in-room spa treatments, farm-fresh meals, dips in the rooftop pool, and a few glasses of red at the one of the area's many standout wineries. Style: Airy, luxurious, and contemporary. 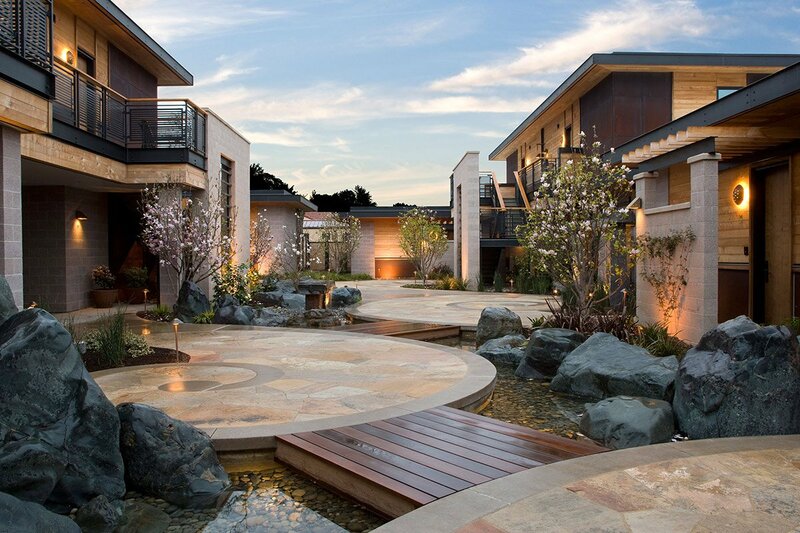 Picture a refined California ranch studded with up-cycled art from the Andrea Schwartz Gallery in San Francisco, add calming stones, water features, magnolia trees, and other elements of Japanese landscaping, and you have the nicest (and most Zen) spa hotel in Napa Valley. Standout Detail: As mentioned, the strong commitment to sustainable practices. Every hotel should be this conscientious and careful. This Place Is Perfect For: Well-heeled, mindful couples, eco-friendly wine lovers, people who love to pamper their pets, and anyone looking to seriously decompress. 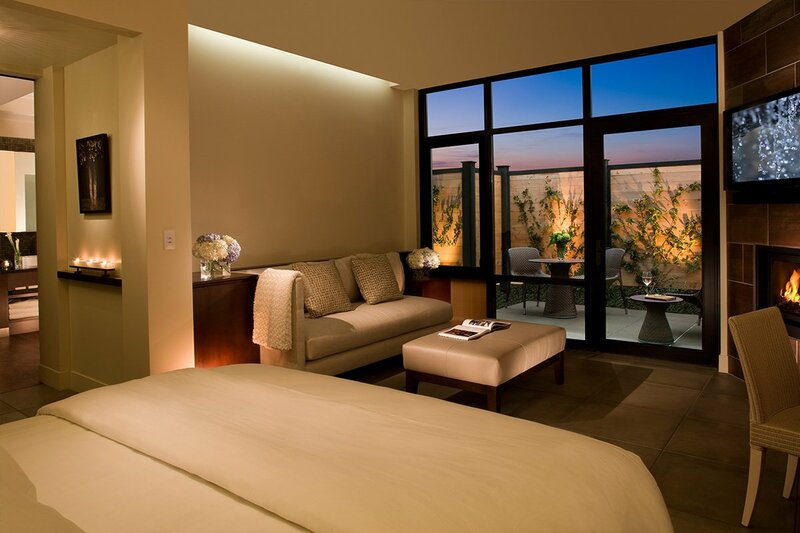 Rooms: To say the hotel’s 62 suites all feel like a spa is an understatement. For starters, they're clustered in "groves" named for the original trees on the property: magnolia, cypress, olive, and birch. And, yes, they’re bathed in natural light, with indoor and outdoor spaces as well as fireplaces, soaking bathtubs, and steam showers, with amenities like Fili D’oro linens, REN bath products, and commissioned photography on the walls. But that’s only the start. Guests can actually take treatments in their rooms. Fifteen minutes before each treatment, a spa butler will arrive to set up massage tables, light candles, draw the shades, and provide any necessary instructions. 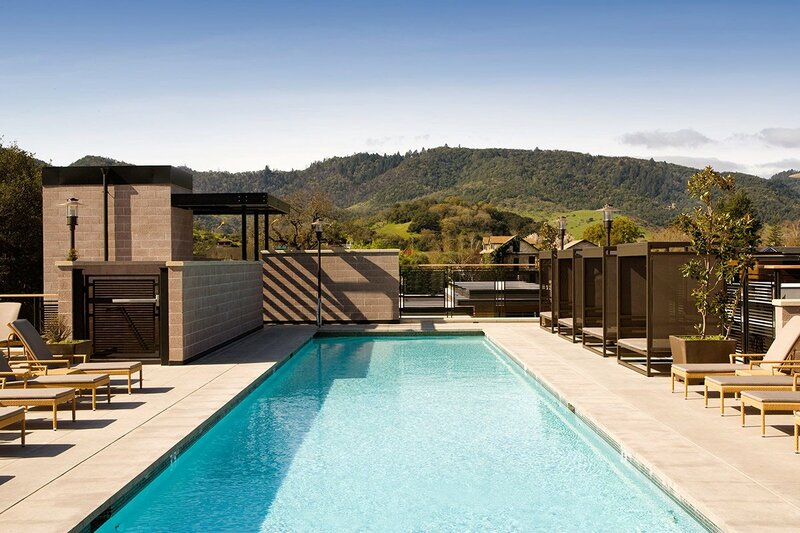 On Site: A rooftop pool, an organic culinary garden, a full-service spa, a fitness center, complimentary bike rentals, morning and evening yoga, some 6,000 feet of event space, and complimentary WiFi and in-room refreshments, including a bottle of Napa wine. 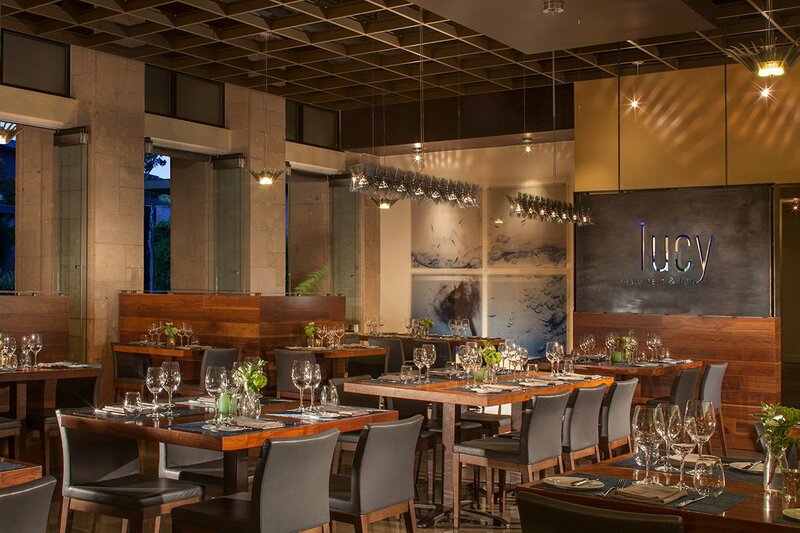 Food and Drink: Lucy Restaurant and Bar, named after the family matriarch, serves breakfast (featuring pastries from Thomas Keller’s Bouchon Bakery down the road), lunch, and dinner made from ingredients sourced from either the on-site garden or purveyors within 110 miles of the restaurant. Rates change seasonally and start at $900/night. Click here for reservations, or get in touch with the Fathom Travel Concierge and we’ll plan your trip for you. 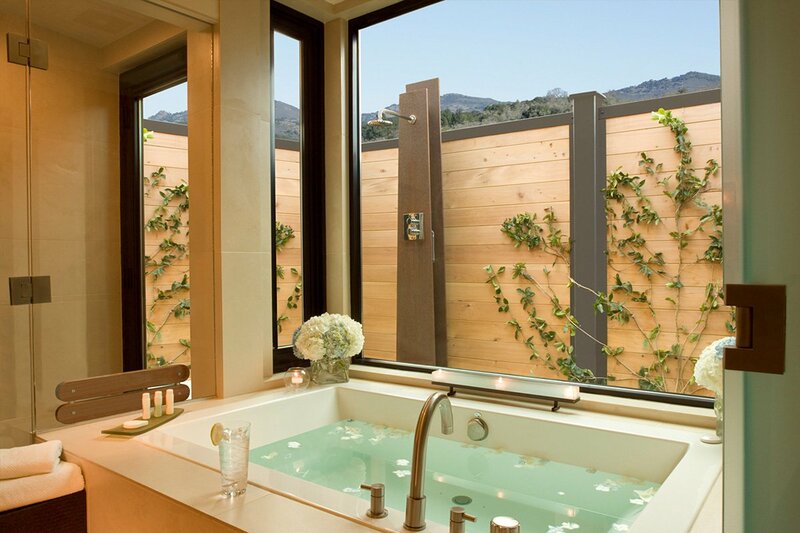 A bathtub in a steam spa suite. 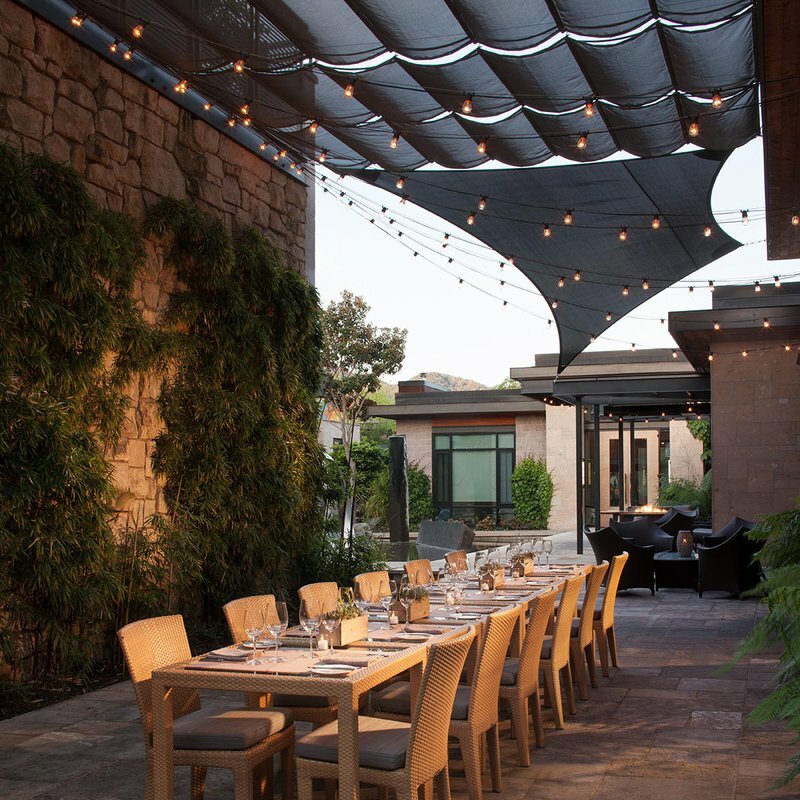 Fancy Yountville is the Aspen of Napa Valley, in no small part because it's home to The French Laundry, the jewel in the Thomas Keller empire. If you can't get a reservation (and you can't), try his more mellow offerings: Ad Hoc, for four-course, family-style meals, or Bouchon, for French fare and a great raw bar. You could brave the long line of tourists anxious for croissants from Bouchon Bakery or just settle for an overpriced bottle of Manni olive oil from Keller's gastro-themed shop, Finesse, which you will think is an art gallery at first glance. Local treasure Bistro Jeanty is unpretentious and Frenchie-cute, down to the copper pots lining the hearth in the dining room. Just when you start to wonder if everything in this walkable town is food-food-food, you'll find high-end fashion, home, and beauty products for women and men at the brilliantly curated Forty Five Ten, an outpost of the influential Dallas emporium. If you want to visit a winery (when in Rome...), nearby favorites include Round Pond Estate and the recently opened (and very, very exclusive) Promontory Winery.